Where do you stay in The City? I should first make clear that New York, or more specifically Manhattan, is “The City.” This is not a statement of arrogance or superiority. It is simply tradition. I grew up in one of the communities that sprang up on Long Island in the first decade after the end of World War II. My parents, like virtually all my friends’ parents and probably all the buyers of the affordable new houses that offered young families their small but tangible piece of the American dream, grew up in apartments in the Bronx, Brooklyn, or Queens. Technically, they were already in New York City, but for them, going to The City was going to Manhattan. My generation inherited this nomenclature. We went to visit my grandparents in the Bronx, but we went to a show in The City. First time visitors to New York seem to want to stay in or near Times Square. That is the heart of the action. All the Broadway Theatres are within easy walking distance of Times Square. Something like eleven subway lines have stations at or near Times Square. It’s close to the Port Authority bus terminal and to both Grand Central Station and Penn Station. Bright lights, big city. That’s about all Times Square is to NYC. It’s dirty, crowded and overrun with guys dressed up like Sponge Bob. As an alternative, head a few blocks east for some real culture at the New York Public Library in Bryant Park. Of course, I can’t entirely skip Times Square, nor would I want to. As I previously mentioned, there’s something about being in Times Square that gets the heart beating just a little bit faster. While I do not want to stay there, when I started planning my trip, I didn’t have a good idea of where exactly I did want to stay. Since I’m going to the theatre a lot, I wanted to be within either walking distance or an easy subway ride. I looked at Airbnb.com and did a search for hotels. I eliminated many options on the basis of price, location, privacy (including not wanting to share the bathroom), comfort, cleanliness, quiet, cancellation policy. Hotels in New York are exorbitantly expensive, and Airbnb rentals are not cheap either. There are bargains to be found on Airbnb, but none of them ticked all my boxes. I did a Google search for “budget boutique hotels nyc” and the first result was for The Quin, on 57th Street at 6th Ave. Rooms there start at $614 per night. That may be in someone’s budget, but it’s not in mine. The second result was for the Hotel Chandler, 31st and Park Ave. Only $371. Only! I tried a few other searches and found an article in Travel & Leisure on the best affordable hotels in New York. The first one on the list was The Standard High Line, on West 13th Street, literally straddling the High Line. Starting price: $429. Pass. Next on their list: The Jane, in the Meatpacking District. This place really struck me as the kind of hotel I’d want to stay at, with a truly unique character. And rooms here start at $125. Only that is for rooms with shared bath. Okay for a night, not for a week. Plus the rooms are right next to the West Side Highway, so not exactly quiet. And for rooms with a private bath, the rate skyrockets to $325. I could go on and on, but this was pretty much the story wherever I looked. So I made a decision. No, not to throw caution to the wind and book a room at the Four Seasons for $1095. Even if I wanted to stay somewhere luxurious and spend a fortune, I would go for one of those boutique‐ish places. But I’m still on a budget. I just decided to crank up the budget slightly. And so I found and fell in love with the Chelsea Pines Inn. It happens to be the top rated New York hotel on TripAdvisor. An expanded breakfast is set out each morning, and guests can enjoy their first meal of the day while planning out their day’s activities. Breakfast consists of hardboiled eggs; sliced meats, cheeses and olives; homemade bread; New York bagels, croissants and muffins delivered each day; fresh and dried fruits; yogurts; cold cereals and hot oatmeal (in season); juices, espresso, coffee and a selection of teas. Breakfast can be enjoyed in the breakfast lounge, the indoor greenhouse or the flower‐filled garden (in season). Okay, so it probably won’t be “in season” when I’m there, but that’s okay. The neighborhood is primarily residential, with a mix of tenements, apartment blocks, city housing projects, townhouses, and renovated rowhouses, but its many retail businesses reflect the ethnic and social diversity of the population. The area has a large gay population. Chelsea is also known as the center of the New York art world, with over 200 galleries in the neighborhood. 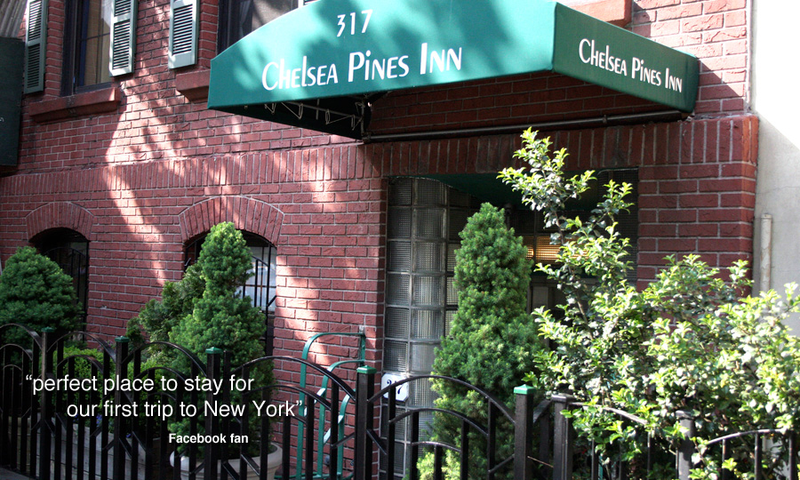 I think I will spend at least one day of my trip exploring the neighborhood around the Chelsea Pines Inn. If the weather is good, I can go for a walk on the High Line, which has an entrance on 14th Street at 10th Ave, or head to Hudson River Park. The Chelsea Market is on 9th Ave. between 15th and 16th Streets. And the streets all around are filled with interesting architecture. And I might check out The Empire Diner, for the architecture as well as the food. Oh, and how big of a budget‐buster is my small room on the 4th or 5th floor of this elevator‐less hotel? $249 a night.